If you want to share the Honey extension with friends and family, you can do so through Facebook or Twitter. You can also copy and paste the referral link and share via email if you’d prefer. Your invitation has no expiration date. 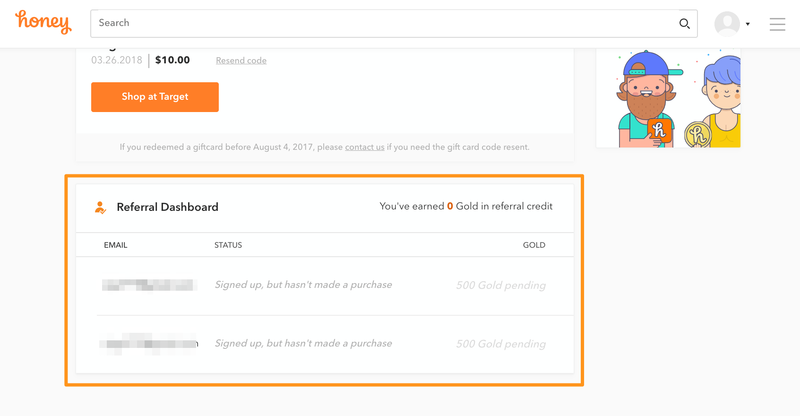 Whenever a friend you refer earns Honey Gold on their first purchase, you'll see a referral transaction pending in your Account Overview. When your friend's Gold posts to their account (usually after 60 days), you will receive 500 Honey Gold from us. You can refer up to 200 friends for a maximum of 100,000 Honey Gold (the equivalent of $1,000). Please reach out to us if you have any questions about the process! What if I forgot to use my friend's referral link?